The Three Stooges were the greatest comedy team of all time. Their great body of work spanned almost forty years and includes over 200 films. Over seventy-five years since they first began their comedy antics, The Three Stooges still regularly appear on television every day of the week all over the world. The faces of Larry, Moe and Curly are more recognizable than many popular film stars of today. Many of the performers and comedians of today repeatedly borrow from and mimic their great comedy routines. It is only fitting that we pay tribute to their great comedy genius with a detailed study and analysis of all their films from their first, Soup to Nuts in 1930, to their last, Kook’s Tour in 1970. 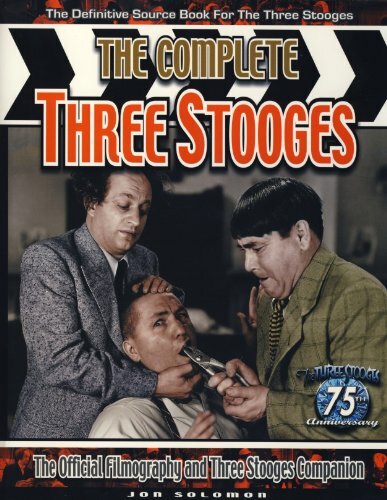 This is the definitive source book on The Three Stooges from respected Stooge expert Professor Jon Solomon, and specifically authorized by The Three Stooges company, Comedy III Productions, Inc. The Three Stooges are the greatest comedy team of all time. Their great body of work spanned almost forty years and includes over 200 films. This book pays tribute to the great comedy genius of The Three Stooges with a detailed study and analysis of all of their films. This is the definitive source book from respected Stooge expert Professor Jon Solomon and specifically authorized by The Three Stoogesâ company, Comedy III Productions, Inc. This is a one of a kind book. The 562 page book presents all of the film work of The Three Stooges from their beginning in 1930 to their last in 1970. Each film is meticulously analyzed and added to the chapters are anecdotes and information regarding the film itself, the supporting players, directors and producers. There is no book quite like this. It is a Stooge fans dream, but it is also informative and quite entertaining for non-stooge fans who are interested in entertainment.